Abdera is a municipality and a former major Greek polis on the coast of Thrace. The ancient polis is to be distinguished from the municipality, which was named in its honor. The polis lay 17 km east-northeast of the mouth of the Nestos River, almost directly opposite the island of Thasos. It was a colony placed in previously unsettled Thracian territory, not then a part of Hellas, during the age of Greek colonization. The city that developed from it became of major importance in ancient Greece. After the 4th century AD it declined, contracted to its acropolis, and was abandoned, never to be reoccupied except by archaeologists. Meanwhile, life went on as the changing population settled in other communities in the region. One named Polystylus changed its name to Abdera. In 2011 the municipality of Abdera was synoecized from three previous municipalities comprising a number of modern settlements.. The ancient site remains in it as a ruin. It now lies in the Xanthi regional unit of Thrace, Greece. The municipality of Abdera has 19,005 inhabitants (2011). The seat of the municipality is the town Genisea. The name "Abdera" is a Phoenician one, shared in antiquity by a town in Spain and another in North Africa. It was variously hellenized as Ábdēra (Greek: Ἄβδηρα), Ábdēron (Ἄβδηρον), and Ábdēros (Ἄβδηρος) before being Latinized as Abdera. (Unusually, it was declined as a 2nd-declension masculine noun despite having a terminal a.) Greek legend attributed the name to an eponymous "Abderus" who fell nearby and was memorialized by Hercules's founding of a city at the location. 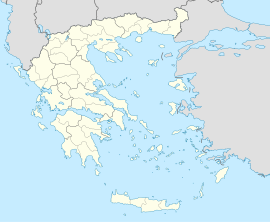 The present-day town is written Avdira (Άβδηρα) and pronounced [ˈavðira] in modern Greek. The chief coin type, with griffon. The Phoenicians apparently began the settlement of Abdera at some point before the mid-7th century and the town long maintained Phoenician standards in its coinage. The Greek settlement was begun as a failed colony from Klazomenai, traditionally dated to 654 BC. (Evidence in 7th-century-BC Greek pottery tends to support the traditional date but the exact timing remains uncertain.) Herodotus reports that the leader of the colony had been Timesios but, within his generation, the Thracians had expelled the colonists. Timesios was subsequently honored as a local protective spirit by the later Abderans from Teos. Others recount various legends about this colony. Plutarch and Aelian relate that Timesios grew insufferable to his colonists because of his desire to do everything by himself; when one of their children let him know how they all really felt, he quit the settlement in disgust; modern scholars have tried to split the difference between the two accounts of early Abdera's failure by giving the latter as the reason for Timesios's having left Klazomenai. The successful foundation occurred in 544 BC, when the majority of the people of Teos (including the poet Anacreon) migrated to Abdera to escape the Persian yoke. The chief coin type, a griffon, is identical with that of Teos; the rich silver coinage is noted for the beauty and variety of its reverse types. In 513 and 512 BC, the Persians, under Darius conquered Abdera, by which time the city seems to have become a place of considerable importance, and is mentioned as one of the cities which had the expensive honour of entertaining the great king on his march into Greece. In 492 BC, after the Ionian Revolt, the Persians again conquered Abdera, again under Darius I but led by his general Mardonius. On his flight after the Battle of Salamis, Xerxes stopped at Abdera and acknowledged the hospitality of its inhabitants by presenting them with a tiara and scimitar of gold. Thucydides mentions Abdera as the westernmost limit of the Odrysian kingdom when at its height at the beginning of the Peloponnesian war. It later became part of the Delian League and fought on the side of Athens in the Peloponnesian war. 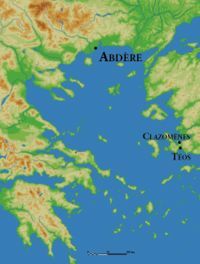 Abdera was a wealthy city, the third richest in the League, due to its status as a prime port for trade with the interior of Thrace and the Odrysian kingdom. In 408 BC, Abdera was reduced under the power of Athens by Thrasybulus, then one of the Athenian generals in that quarter. The town seems to have declined in importance after the middle of the 4th century BC. Cicero ridicules the city as a byword for stupidity in his letters to Atticus, writing of a debate in the Senate, "Here was Abdera, but I wasn't silent" ("Hic, Abdera non tacente me"). Nevertheless, the city counted among its citizens the philosophers Democritus, Protagoras and Anaxarchus, historian and philosopher Hecataeus of Abdera, and the lyric poet Anacreon. Pliny the Elder speaks of Abdera as being in his time a free city. Abdera had flourished especially in ancient times mainly for two reasons: because of the large area of their territory and their highly strategic position. The city controlled two great road passages (one of Nestos river and other through the mountains north of Xanthi). Furthermore, from their ports passed the sea road, which from Troas led to the Thracian and then the Macedonian coast. The ruins of the town may still be seen on Cape Balastra (40°56'1.02"N 24°58'21.81"E); they cover seven small hills, and extend from an eastern to a western harbor; on the southwestern hills are the remains of the medieval settlement of Polystylon. The municipality Abdera was formed at the 2011 local government reform by the merger of three former municipalities that became municipal units: Abdera, Selero, and Vistonida. The municipality has an area of 352.047 km2, the municipal unit 161.958 km2. The municipal unit Abdera is subdivided into the communities Abdera, Mandra, Myrodato and Nea Kessani. The community Abdera consists of the settlements Abdera, Giona, Lefkippos, Pezoula and Skala. Landmarks of Abdera include the Archaeological Museum of Abdera, and Agios Ioannis Beach (also Paralia Avdiron) near the village Lefkippos. ^ "Administrative changes in OTA". EETAA. 4 December 1997. Archived from the original on 2016-12-12. Retrieved 9 December 2016. ^ a b Graham (1992), pp. 44–45. Smith, William, ed. (1854–1857). "Abdera" . Dictionary of Greek and Roman Geography. London: John Murray. ^ Pseudo-Apollodorus, Bibliotheca, ed. Wagner, R. Leipzig: Teubner, 1894; Mythographi Graeci 1, Chapter 2, section 97, line 7ff. ^ a b Hornblower, Simon (1996). "Abdera". The Oxford Classical Dictionary. Oxford: Oxford University Press. p. 1. ^ Graham (1992), p. 46. ^ Graham (1992), pp. 45–47. ^ a b c "Abdera". Encyclopædia Britannica. I: A-Ak - Bayes (15th ed.). Chicago, IL: Encyclopædia Britannica, Inc. 2010. p. 19. ISBN 978-1-59339-837-8. K. F. Hermann, Ges. Abh. 90-111, 370 ff. ^ Diodorus Siculus, Bibliotheca historica, ed. Vogel, F., Fischer, K.T. (post I. Bekker & L. Dindorf), Leipzig: Teubner, 1:1888; 2:1890; 3:1893; 4–5:1906, Repr. 1964. Book 13, chapter 72, section 2, line 2. ^ Cicero. Epistulae ad Atticum, 4.17.3, 7.7.4. Grant, Michael (1986). A Guide to the Ancient World. Michael Grant Publications. Wikimedia Commons has media related to Abdera. Stillwell, Richard, ed. (1976). "Abdera, Thrace, Greece". Princeton Encyclopedia of Classical Sites. "Abdera". Hellenic Ministry of Culture. 2005. Archived from the original on 2008-02-03.